Way back in April, at the end of the semester, I brought home some kimchi we had made in my food lab course. And it has sat, basically untouched, in my fridge since then, in the only clean jar I could find – an old Cheez Whiz jar (don’t judge – my family likes to eat the stuff). Funny story – I didn’t think to bring a container with me to class that day, and when I saw they were giving us the chance to take home some of the kimchi, I rummaged though my things for something to transport it back to the ‘burbs in. The only thing I could find – a ziploc bag. So off I went, with a ziploc full of pungent kimchi. And of course, I didn’t head straight home after class – I went out for dinner to celebrate the end of the semester. Let me tell you, my school bag was a bit ripe for a little while afterwards. Every time I open the door to the fridge, I see my jar of spicy, delicious kimchi staring back at me, just waiting patiently for the day when I deem it worthy to be consumed. Problem was – I had no idea what I wanted to do with it. It tastes good on its own, but I find that I can only have a bite or two, then it becomes a bit overwhelming. So there it sat…until I had an idea. – I bet that kimchi would be great just mixed into some hot brown rice. – But that’s not really enough for a meal. What else could I add? 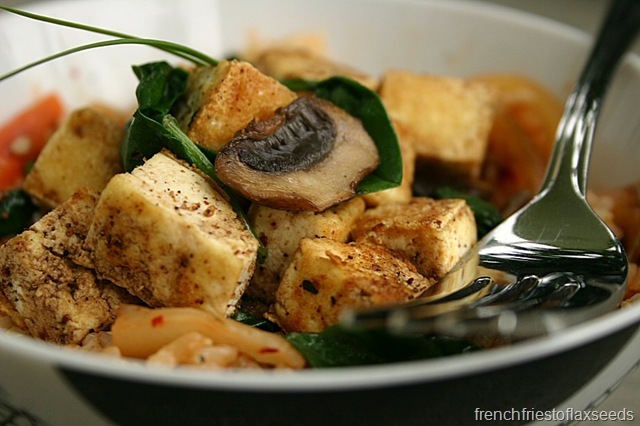 – Oooh, what about some crispy pan fried tofu? I haven’t had tofu in ages. – Still needs something. More vegetables. Steamed broccoli? Mushrooms? Both? And that’s almost exactly what I ended up with…almost. 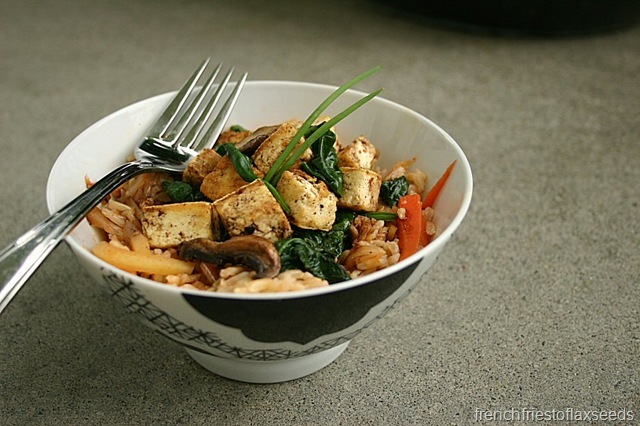 When I finally set out to make my kimchi tofu rice bowl, I noticed the big containers of baby spinach were on sale. So I scrapped the broccoli for spinach, and voila – dinner was born! There’s really no recipe. Cook up some brown rice. Drain and press firm tofu, cube it, and pan fry it with some oil, and seasonings (I went with garlic, ginger, red chili flakes, salt, and pepper). Sauté some brown mushrooms and add baby spinach at the end to wilt. 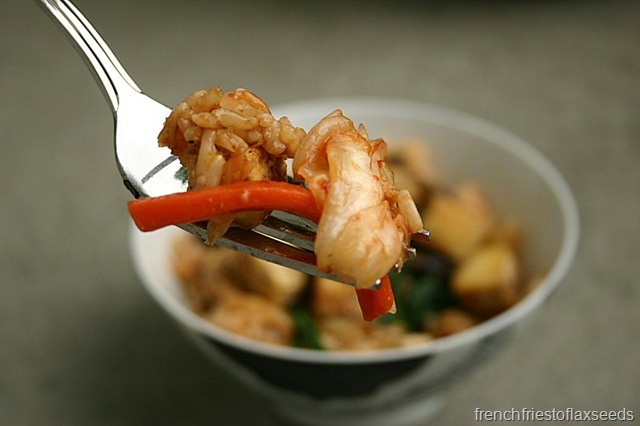 Mix a serving of brown rice with a generous scoop or two of your kimchi. 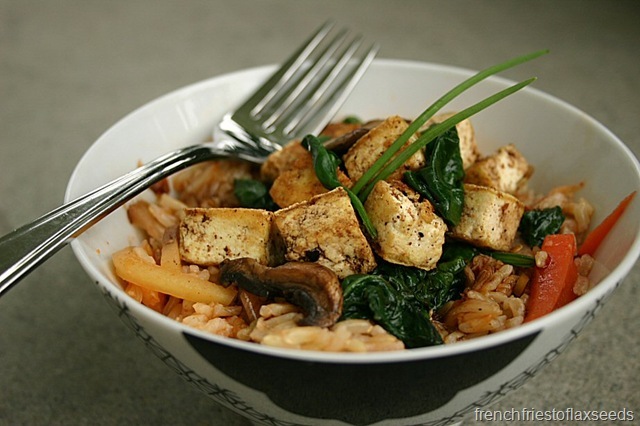 Top with tofu, mushrooms, and spinach. Sprinkle with soy sauce and sesame seeds (I was out of the latter). Inhale the gorgeous spicy aromas and enjoy a bowl of happiness. Kimchi may just be my new favourite rice condiment. I love when an abstract meal idea turns out to be such a success! 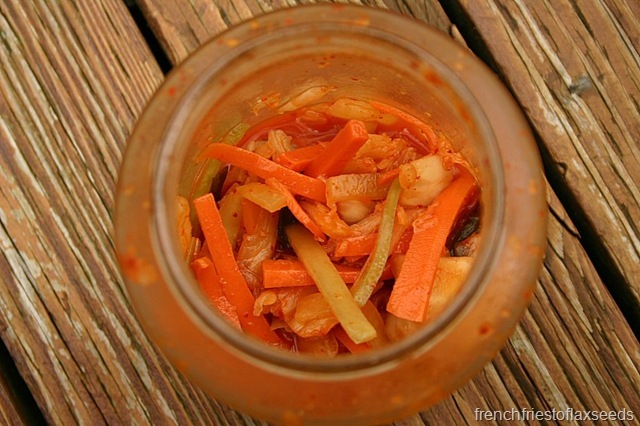 FYI – Kimchi is a traditional Korean fermented dish, usually made from a variety of vegetables and seasonings. Fermentation means gut friendly bacteria, which makes it a great food to add to your diet – not mention the vitamins, minerals, fibre, and flavour it provides. 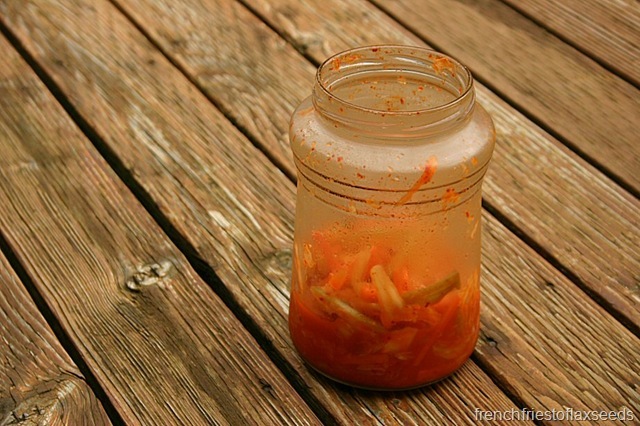 I’ve never tried kimchi, but this post is making me think that it should be next on my “must taste” list! Oh my! Just when should I be expected for dinner?! What in the world is new with you? I need more Marianne in my life! I’m a Korean and kimchi has definitely been a staple in my childhood life. 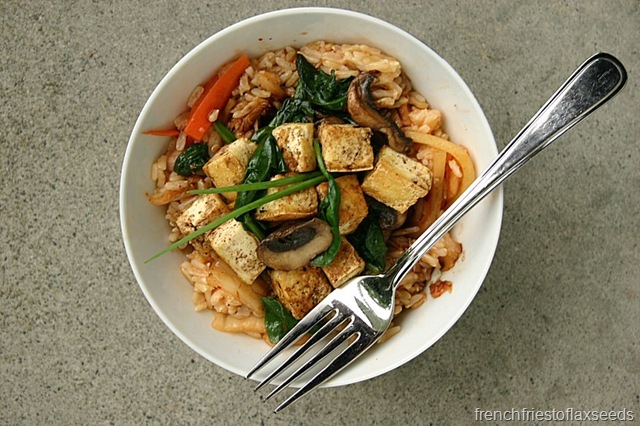 Kimchi is great with plain, raw, tofu, too! Another recipe suggestion: instead of tofu, replace with eggs! It tastes even better, I swear. If I liked eggs, I would totally try it!